Today I will talk with a super learner about Chinese, Oksana Ermolaeva (桑娜sāng nà). She is the founder of the Facebook page Mandarin Chinese From Scratch. It includes various Chinese learning materials, and she also shares her successful learning experience on it. Her page is getting more and more popular now. As a Russian, Oksana has been learning Chinese for more than two years. She is a freelancer. She works as a writer and translator at home. Two years ago, she translated many different English works into Russian, and from Russian into English. But now, more and more people realize that English is easy to learn, and she has many competitors in the translation market. So she decided to boost her experience by learning Chinese. She always believes nothing is impossible, just do it. CJ: Why do you learn Mandarin Chinese? Oksana: Actually, at the very beginning, it was like a hobby. I like learning languages. I know English. I know a little bit of German and French. But, after all, I understood that European languages are actually very similar and, if you know English, you can quite easily learn Spanish and Italian. 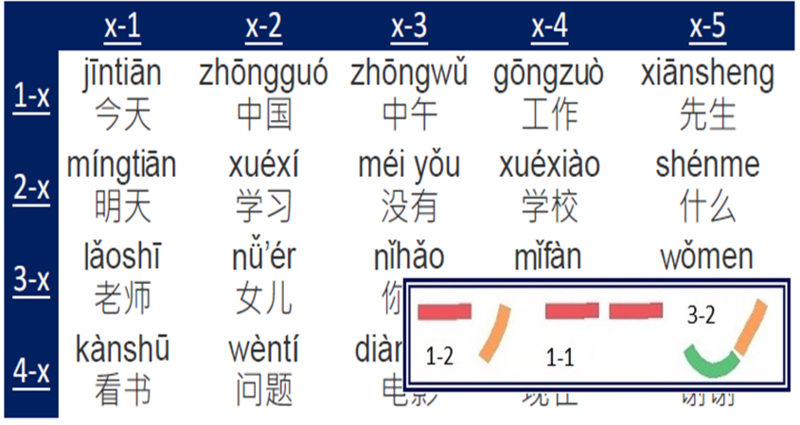 They have the same roots, but of course, Mandarin Chinese….Learning Mandarin Chinese is a challenge, a big challenge. And I decided to try this. I was not sure of whether I would be able. Many people, you know, say that it is impossible to learn Chinese when you’re an adult, and I think it’s a very big and very harmful stereotype, because it forces people to refuse, even without trying. But, actually, I have proven that it is possible to learn, even if you are older than thirty years old. I had never known Chinese in my childhood. So, it’s possible. Nothing is impossible. CJ: Do you have any interesting stories? Oksana: I started to learn Chinese via Skype. It was amazing. Later, I decided to go to China and arranged studies in a language school in Hainan. When I came to China, I was pretty sure that I could speak and that I could understand. But when I came, I realized that nobody understood me, and I could understand only a few things. But, after the one month I spent at that school, I progressed very quickly. My oral speech progressed very quickly, and also my comprehension and reading. So, it was like from zero level to second or third level in one month. And I continue studying Chinese. 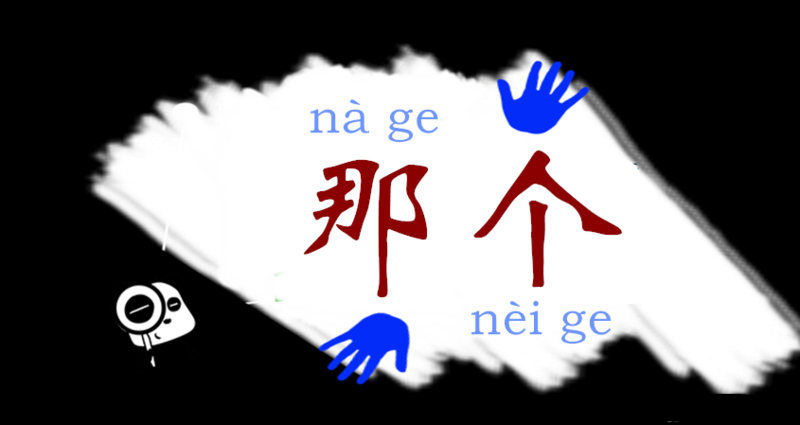 I want to polish my knowledge of Mandarin, to know more and more about the Chinese language and Chinese culture. As a writer, I work mainly for travel websites and magazines. It is also very useful to know Chinese, because you can get more information if you can learn and read the characters; you can get more information and be a better writer. That is amazing and interesting. And the more I learn, the deeper I want to dive into it. I have been learning for more than two years. CJ: Chinese characters are very difficult for foreigners. What do you think? Oksana: I think it`s difficult to start. If you have never tried it before, it’s very difficult to move from writing letters to writing characters. But as you try it, you will like it. I know many foreigners—many Americans, British, and Russians—like it and they are very involved in this. It’s like an adventure into writing characters. It`s very interesting. When you have already started this, it is not so difficult. It’s the very beginning. Nowadays, I focus on learning by myself, and also to engage my kids into studies. And my older daughter is seven years old and, if we are able to move to China, she will definitely have to learn something from Chinese language. So, this summer, I tries to engage her and she really likes writing characters. For her, it’s not a difficult task. It’s just drawing an image. CJ: Why did you start to post on Facebook? Oksana: The reason why I started to write on Facebook—maybe it is interesting for you. It was clear for me that when you learn Chinese via English, you get much more materials than when you get it only from Russian textbooks, because there are only a few of them, really only a few. Many of them are written by Russians, and they’re not up to date. They contain many phrases and words that are out of use now. And I also found that there were lots of very good English materials for learning Chinese, so I decided to share my knowledge with Russians who don’t know English. It was the main reason. I learn from an English-speaking teacher. I have notes in English, but I also translate them to Russian to share with my Russian fellows—with my Russian readers. When I started the Facebook Page, I was pretty sure that only Russians would be interested in them. I only left English on the page because I just have these notes—because when I study, I have notes in English. So, why move them? So I decided to leave them. And then I was surprised that no Russians came. Lots of people from all over the world came. I think the first was from Thailand. The second was from the USA. Russians are only the third group of readers. There were many people living in Italy and Brazil among my readers. 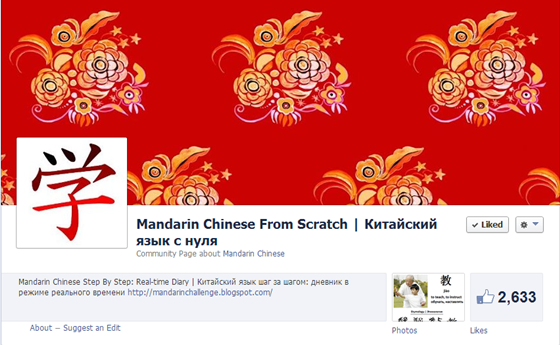 And I also know that there are some people who don’t know Chinese, but they learn Russian using my page. This was a big surprise for me. I tried to get in contact with some people—with some readers—and some of them said that, in our country, there is the same problem as with Russian; they don’t have many materials for learning Chinese. CJ: You tear down the original Chinese character and explain how they come to modern Chinese characters. It bears a lot of Chinese culture and history. That’s great. I think people like my topics, because I usually try to pick out some topics that are really interesting for people. You know, textbooks provide topics, but a very limited choice of topics. For example, food, supermarket, and restaurant, and so on; but I try to cover more topics that are used in everyday life, but not so often highlighted in textbooks. So I think people like my Facebook Page because they find more unusual words, more unusual phrases they care to know. CJ: What`s your impression about China? You`ve come to China three times. Oksana: I really like China and I appreciate Chinese people because they are such hard workers. They change everything very, very quickly. And it’s amazing, especially, you know, in Shanghai, there is a museum where the landscape of Shanghai in 1990s is presented and what we can see now. It’s amazing. Only in twenty years, and the changes are—it’s totally changed. There were some situations, like cultural shock. For example, I still find myself getting used to traffic. Sometimes it is scary. I couldn’t realize how they move; how they drive and break all the rules and not collide. Of course, I met many interesting people, and they told me about many interesting Chinese traditions. They showed me so much that was interesting, so I really like China. CJ: What`s your future plan? I saw you built a Chinese blog. Oksana: I’m thinking about building a project, maybe a website that helps people. This blog is not the main thing. I use it only when I have to post flash cards. It is very simple. Facebook doesn’t allow me to create flash cards that are easy to study. It allows only images, but on blogs, you can create flash cards with quizzes. And you can embed these flash cards in the blog. So, my blog is not very important. If I have this kind of material, I provide the link on Facebook so that people there can go to my blog and play with flash cards. CJ: So, you think the flash card is a very good way to learn Chinese? Oksana: I think it’s the only way to learn characters. I usually use several types. I use paper flash cards. I place them on my refrigerator. I just see them every day, and the more you watch, the more you memorize. It’s an old, but very good working, method. But sure, I use online flash cards because, nowadays, when they have smartphones and tablets, it is very easy when you go somewhere by car or by bus. You have lots of time and you can practice. And if you use online cards, then you can listen to the pronunciation. Practice your Chinese skills. CJ: How did you edit the content? CJ: As a foreigner, what’s your advantage when you made Chinese learning content, compared with other Chinese teachers? 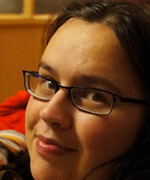 Oksana: I think that, on Facebook, there are very many good Chinese teachers, and I read their blogs. I always like other pages. I don’t consider them competitors, because they’re teachers for me. And I really like their pages. A few are listed, such as Touch Chinese. They’re really wonderful, and are supported by great Chinese teachers. But, as for my page, it is a tracking of a student’s studies and it is the student’s view. It’s also very important. Teachers sometimes have a very narrow angle. They know the method—how to teach—and they follow it. But when a student writes about his or her studies, it has another point of view; for example, topics—you really need to cover more interesting topics. Oksana: I think that the biggest challenge was to force myself to learn writing. You know, many people say that it’s not very important to learn how to write in Chinese. You just have to learn by heart some words and just learn the talking; but for me, I learned to talk quite quickly. After one year of learning, I could talk about everyday topics with my teacher. But I realized that, if I would not learn writing and reading, I would not progress much, because we just continue to talk about everyday life, and it doesn’t require knowledge of many words. If you really want to talk on complicated topics, you have to learn writing and reading. Many people begin with learning just word speech, but if you want to know a language really good, you have to learn writing and reading too. And it was a very big challenge for me to force myself to start learning characters. CJ: What characteristics do you think a great student of Chinese should have? Oksana: I think motivation is good. You should be motivated. And if you don’t want to move to China, if you don’t want to learn in a Chinese University, you’re not highly motivated, but you still can create some motivation for yourself. So, find some specific goal and say, “I want to achieve this goal,” and it helps to raise your progress in learning language. Blogging is a good motivation too, because sometimes I could say, “I don’t want to,” but now, no way. I have to blog every day or try to do so. CJ: What do you think they should avoid? Oksana: Avoid laziness. Not to be lazy. And of course, it is better to avoid stereotyping, because, as I’ve said before, many people say it’s impossible. No, everything is possible at any age, not only kids can learn Chinese. Adult people can learn too. My favorite Chinese proverb ever—I can be mistaken, but: “Don’t bother a person who is doing something with saying it is impossible.” Let him do it. Just let him do it. Don’t say it’s impossible, and you will see he will definitely do it. 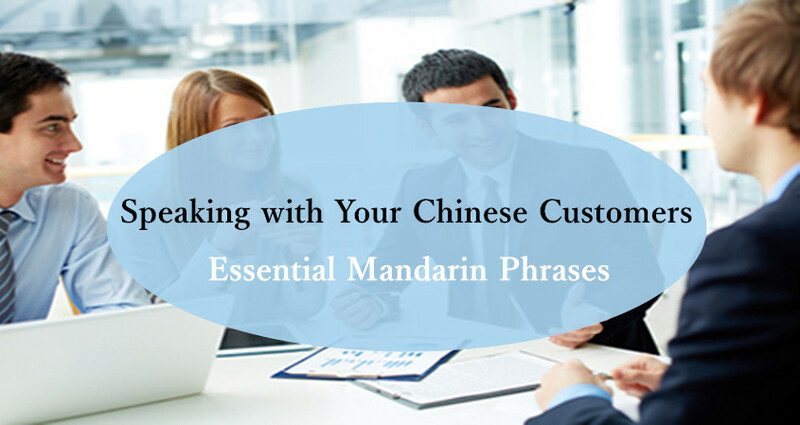 CJ: Could you please tell our DigMandarin readers how to learn Chinese better? Oksana: Try more. And of course, blogging is a good way to improve your language skills. And of course, it helps you too. It boosts your knowledge. You will know more and always try and find more and more topics. It’s good advice for everybody who wants to progress in any foreign language, not only in Chinese. To blog and track your studies on Facebook or somewhere else, such as any social network.